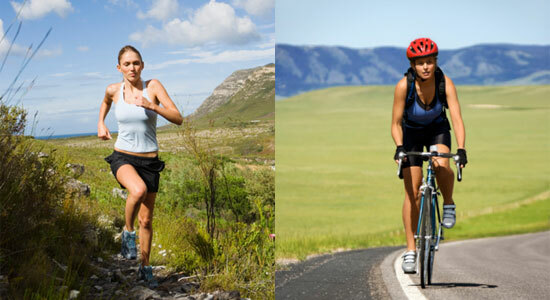 Which Is Better; Running Or Cycling? To start with it’s important to understand that any form of exercise helps you burn calories and improve your cardiovascular health. But the easy accessibility of cycling & running makes these two a common choice among people. However, people often find themselves struggling with the very idea of which of the two is a better choice. Running is perfect for shedding the inches and losing weight. If your primary aim is to lose weight and cut a few inches off your waistline, then running should be your choice of activity. Why? Because running helps burn significant amount of calories. The faster you run, the more is your calorie burnout. High intensity workouts like running helps you burn more calories than low intense exercises like walking or cycling. Cycling is the best form of exercise for those who are recovering from an injury, looking at cross-training options or seeking a way to preserve their knees. Both cycling and running have many health benefits like depression, anxiety and stress control. Other than this where cycling leads to improved muscle strength and concentration power, running helps you reduce high blood pressure and the risk of a heart attack. Both running and cycling are great ways to improve mood and beat fatigue. If you are someone who loves speed and adventure, then cycling is meant for you. For overweight people however cycling often causes frequent pains around their knees and ankles. Moreover, the aftereffects of both the workouts make your feel good, but when it comes to running, the feeling of joy is just a little more. Research has proved that running releases endorphin which leads to a euphoric boost and lighter mood – something similar to what happens when you smoke Cannabis. Running is a full body workout, whereas cycling, on the other hand is more of a lower-body workout. It primarily strains your quads and legs. Ultimately, it all comes down to doing what you want and adapting a habit of daily-workout. There are many services that keep you inspired to workout daily like FITSO, a mobile application which helps you find running/cycling partners around you – something that keeps you motivated to be punctual in your fitness routines. So, cycling and running both have their own benefits. The important thing is when you’re out do whatever feels right in the moment.